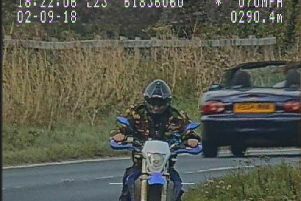 A motorcyclist has been sentenced for covering his numberplate with a bag before speeding past a police camera van. Richard Burndred admitted perverting the course of justice and speeding when he appeared before a judge at York Crown Court. The 38-year-old was near High Kingthorpe, between Pickering and Whitby when he committed the offences. He was riding a Yamaha motorcross bike at 70mph – 10mph over the speed limit – as he approached a police safety camera van. Fearing he had been recorded speeding, he stopped short of the van and used a bag to cover his number plate. He and another rider then travelled back in the direction he had come from. Police suspected him of perverting the course of justice and launched an investigation led by Traffic Constable Andy Forth from North Yorkshire Police’s Traffic Bureau. Burndred, of Huddersfield, was interviewed about the incident, which happened last September, and admitted covering his registration plate to try to avoid getting points on his licence. He pleaded guilty to perverting the course of justice and speeding at York Crown Court on Tuesday. A judge gave him a four-month prison sentence, suspended for 12 months, three penalty points for speeding and ordered him to pay a total of £865. After the hearing, TC Forth said: “This is the second motorcyclist successfully prosecuted by North Yorkshire Police for this type of offence. “This act – which seems to be on the increase within the motorcycle community using North Yorkshire’s roads – will not be tolerated and any reports will be investigated and offenders put before the courts. “Already this year, numerous reports have been made and other riders are currently under investigation for similar incidents.